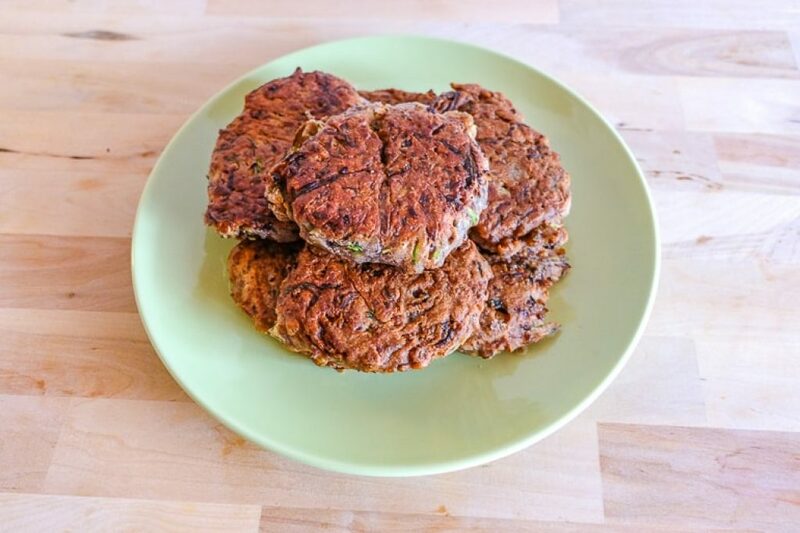 Try This Vegetarian Bean Zucchini Fritters Recipe For a Change! 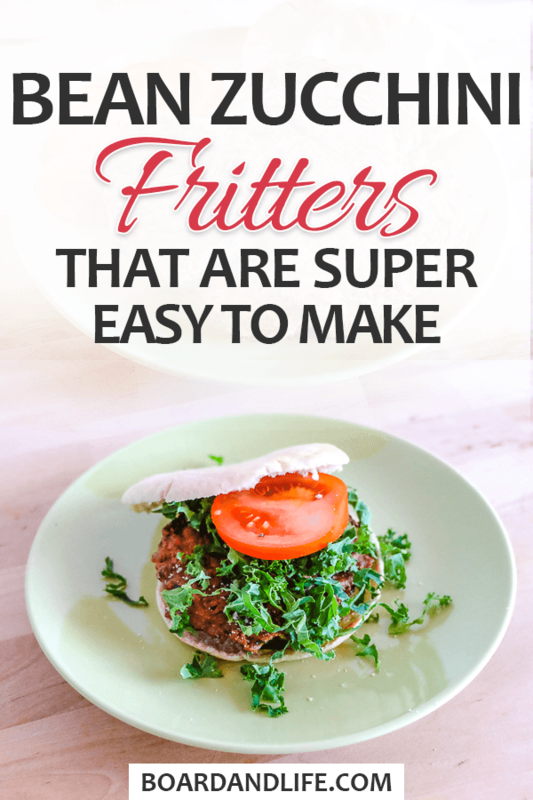 If you’re looking for a quick dinner idea, fritters can be a great option. 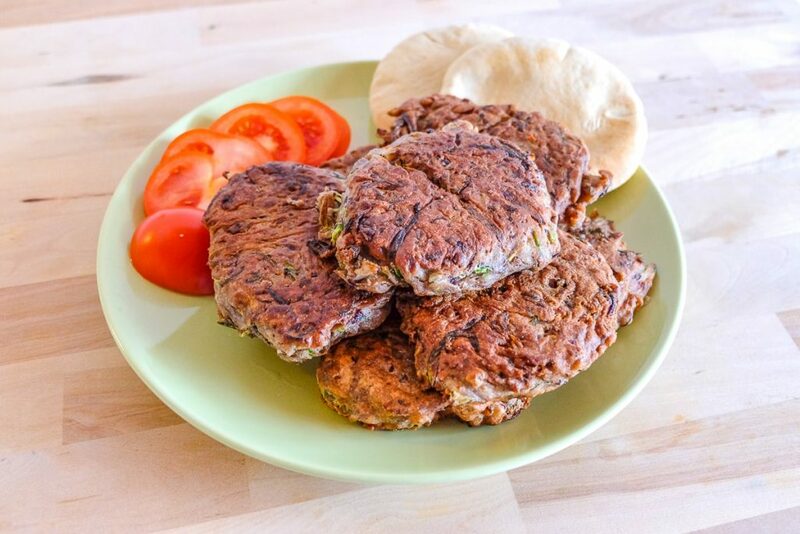 Fritters are versatile – they can be healthy or not, baked, fried, made vegan, whatever you like! We’ve been trying to eat healthy over the last few months. We’ve got a handle on healthy snacks that we love, and we’ve even stayed pretty committed to eating a salad every day for lunch. That said, some days – we just crave something fried! Since we really like zucchini, we decided to hunt for a great zucchini fritters recipe. 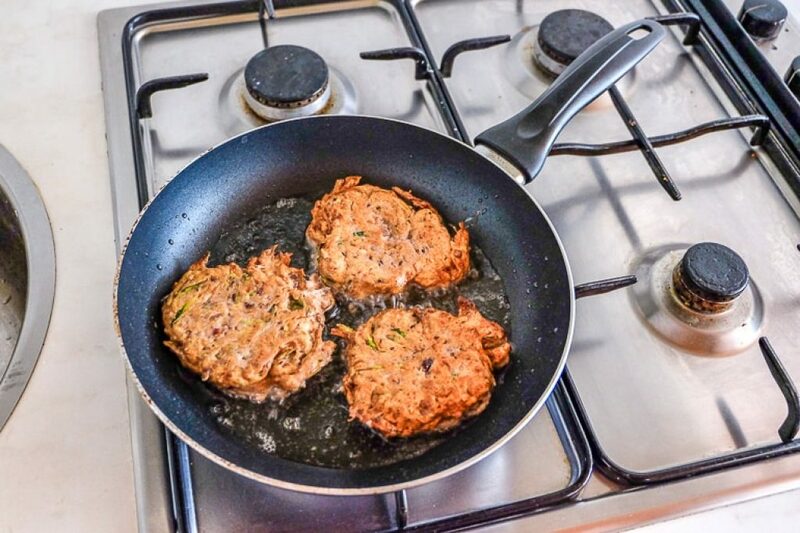 After numerous substitutions and changes, we’ve now perfected our bean zucchini fritters recipe! Our crispy zucchini fritters are fried but you can do them differently. So, we’ll tell you step-by-step how we make them (with photos), what you can add or leave out, and what to serve them with! Ready to cook? Let’s fry some fritters! 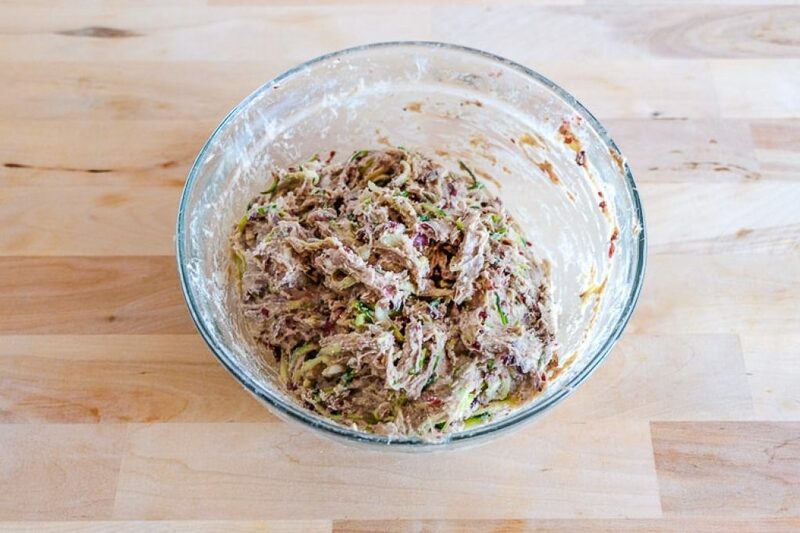 This is how we make our bean zucchini fritters. Of course, you can change up the recipe – and we’ll tell you where you can do that and what ideas we’ve already considered to help inspire you. 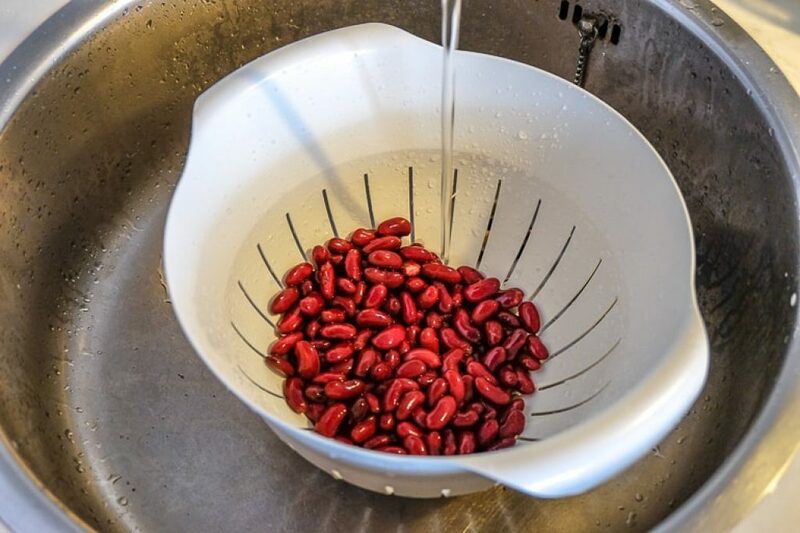 First, we wash and drain the kidney beans. Get out a strainer in the sink and give them a nice little bath. This is if they are canned. You could definitely also use another type of bean (black, pinto, etc) since they are generally the same consistency mashed up. 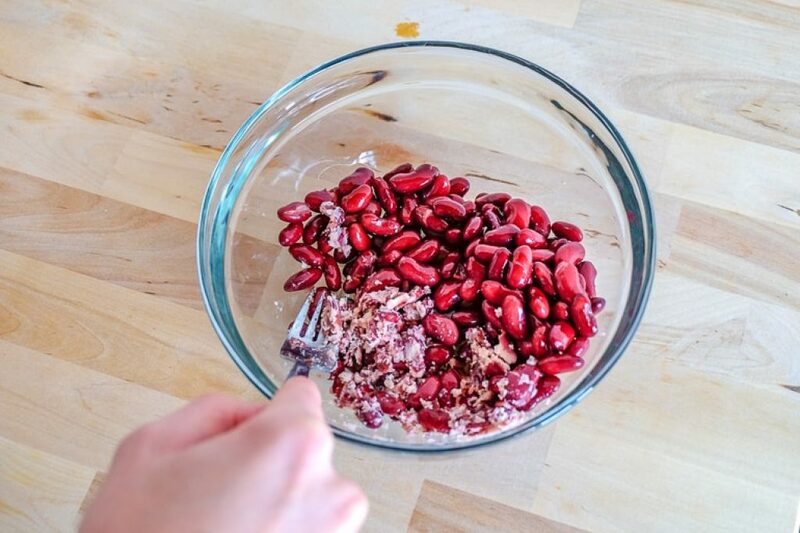 Kidney beans having a bath. Next we mash the kidney beans. We use a fork but you can use a potato masher if you have one. Mashing the beans with a fork takes time…. 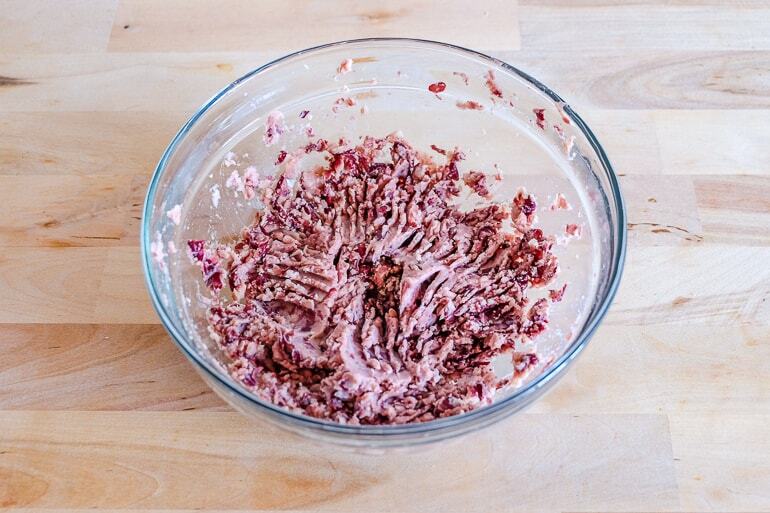 The beans should look like this – they need to be more of a paste since they fry easier without large chunks. 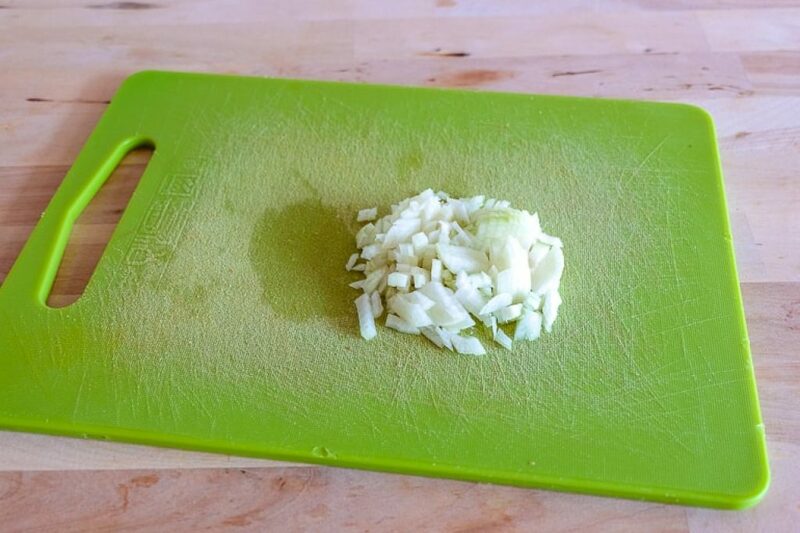 Next up, finely chop the onion. Again, the smaller the better since larger clumps make frying/mixing more difficult. Mix the onions into the mashed beans. Pretty self-explanatory. Onions and beans sharing a snuggle in the bowl. 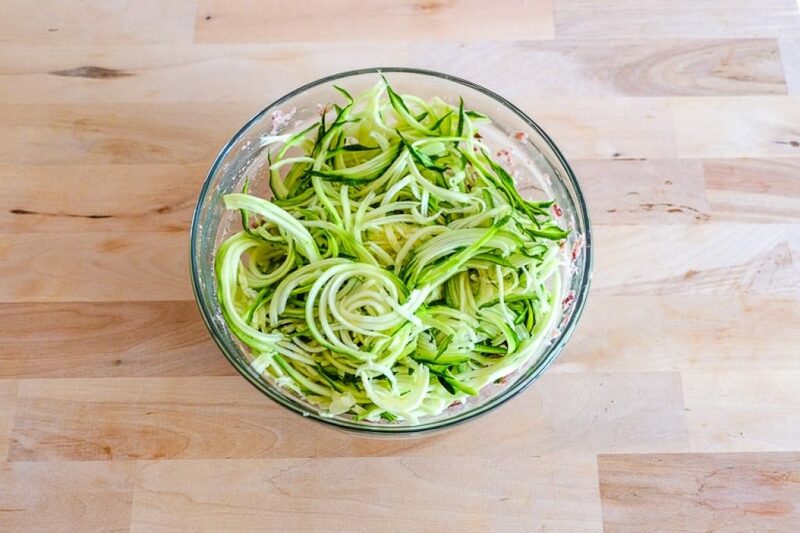 Next, you’ll wash, dry, and trim your zucchini. We have a green cutting board so that they feel more at home, but any color will do. Oh no, here comes zucchini to ruin the snuggle. 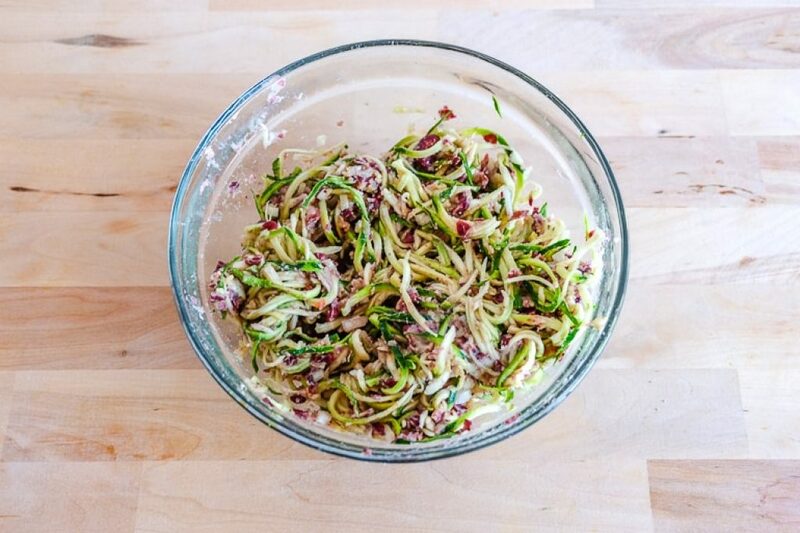 Next, grab your spiralizer OR grater and get that zucchini smaller. 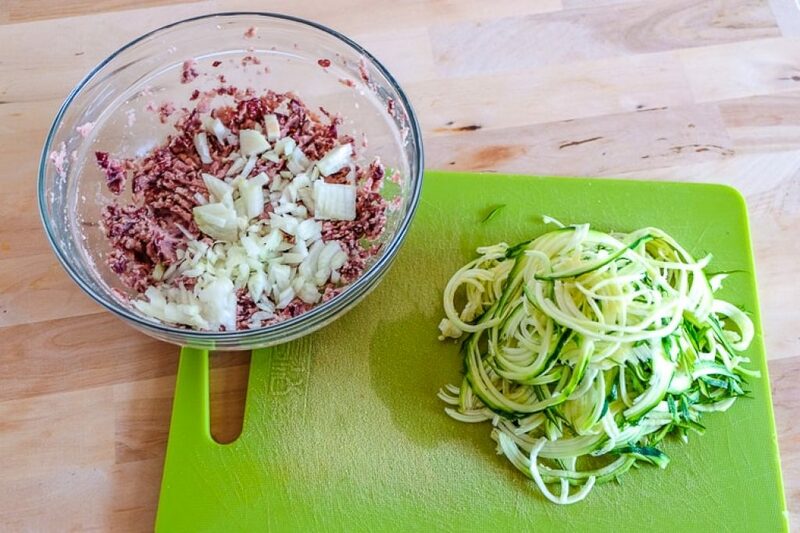 If you want to know what a spiralizer is, you can find one here. It’s exactly like the one we have – which is a manual one. 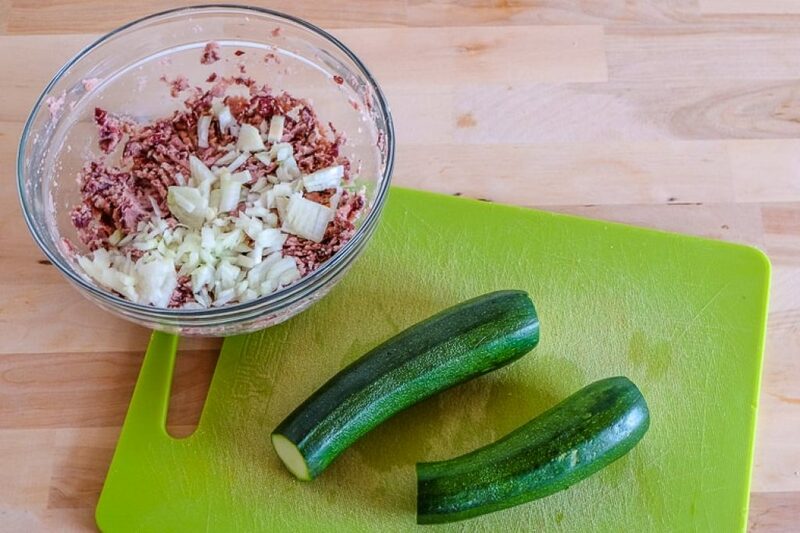 As you may have guessed, add the zucchini to the bowl of relatively dry ingredients thus far. Next, mix the contents of the bowl. You can use a spatula or your hands. Lisa likes to use her hands because it’s easier to control where the things go. Now, add your eggs. Two whole eggs right into the batter. You can opt out of eggs here and choose to put in an egg substitute if you are vegan (we haven’t personally tried that yet, though). Mix all of that together in the bowl. 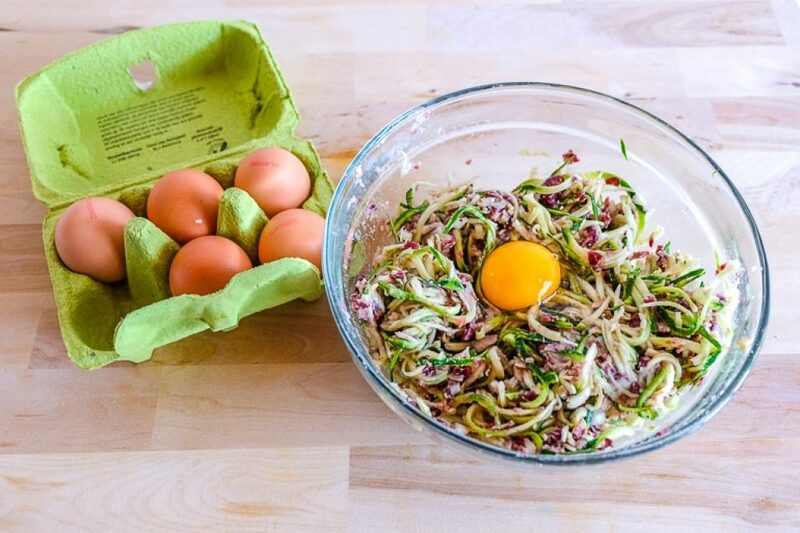 This is only one egg – add the other one, too! Time to add flour. We use buckwheat flour since it’s a little more dense (and generally healthier than white flour) but you can choose any flour you like. Just remember it MAY change the moisture level of the batter so you might have to add more of less water in the next few steps. Finally, mix together all those ingredients. You’re aiming for a thick batter that doesn’t run very easily. If it’s too thick, add a bit of water (or milk) and mix. Too runny? Add more flour. The final batter before frying! 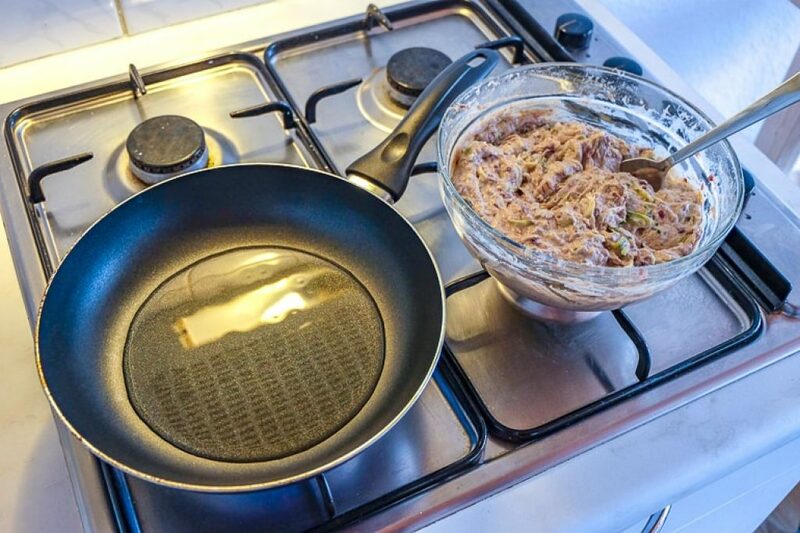 Now that the batter is done, toss the oil in the pan and get it heated and ready to fry. Medium/high heat is best – too hot and it’ll make the oil/pan smoke. Get the oil nice and hot. Take a tablespoon and place a heaping amount of batter into the pan. We could fit three in our pan to fry comfortably. We flattened them a bit with the spoon but they will do this naturally when flipped. Frying one side of the fritters. After about 3 minutes, the bottom is golden brown and solid to flip. Grab your flipper and turn them over. You can use a fork to guide the flip and so that you don’t splash the hot oil. BE CAREFUL HERE. Basically just brown the other side and flip again after about 2/3 minutes as needed to keep the sides evenly cooked. Stack the fritters on a plate – you can even pat them down with a paper towel to catch excess oil. Eat them as soon as you can because they are great fresh out of the pan. Let them cool a bit though, obviously. Aaand done! We like to eat them in a pita with tzatziki, a tomato, lettuce, and/or cheese. 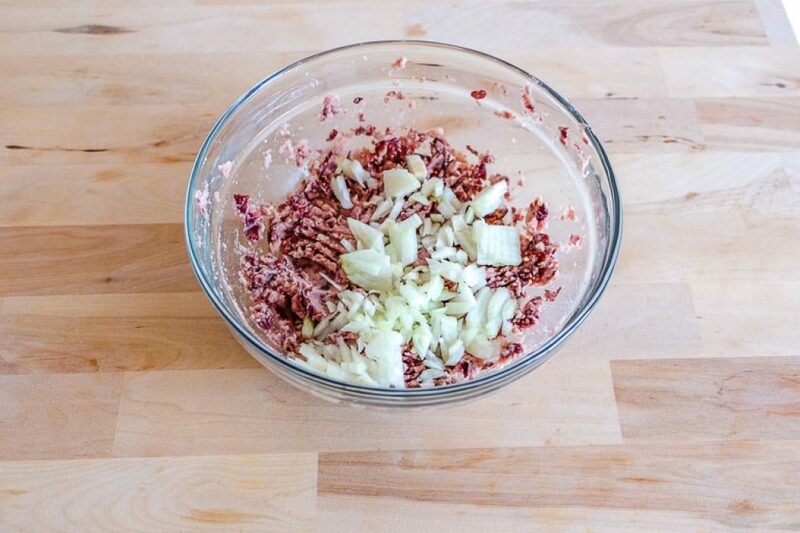 Basically, it works really well as a burger patty alternative. Bruce eats his with sriracha for a hint of spice. 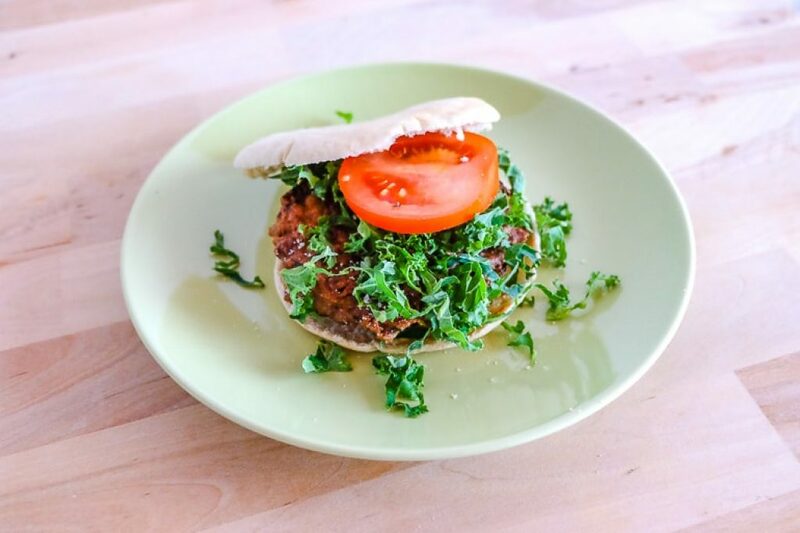 How we enjoy our fritters – SO good! Just so you know, these ingredients make about 8-10 fritters. It really depends on how much batter you scoop out into each one when frying. 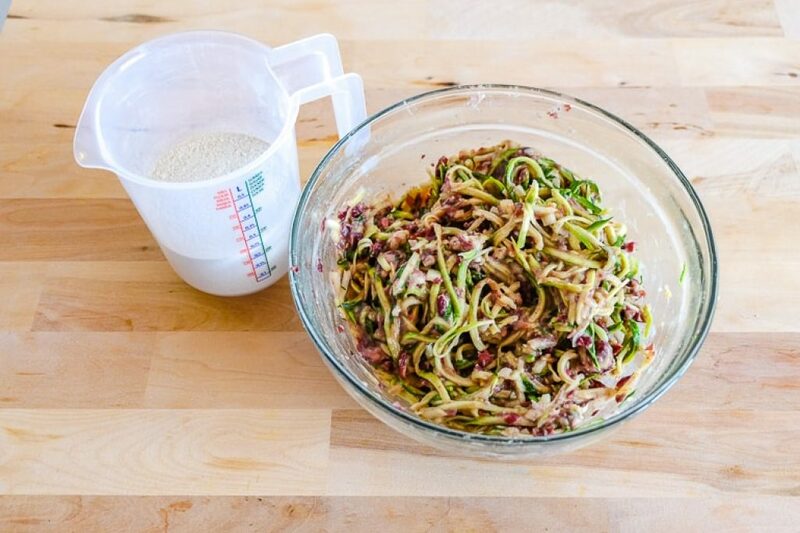 Here are the step-by-step instructions for how we make our bean zucchini fritters. And there you have it – our recipe for bean zucchini fritters. As we mentioned, you can definitely change it up a bit to suit your tastes. We love this recipe like this – but we are definitely up for hearing about how you change it up. 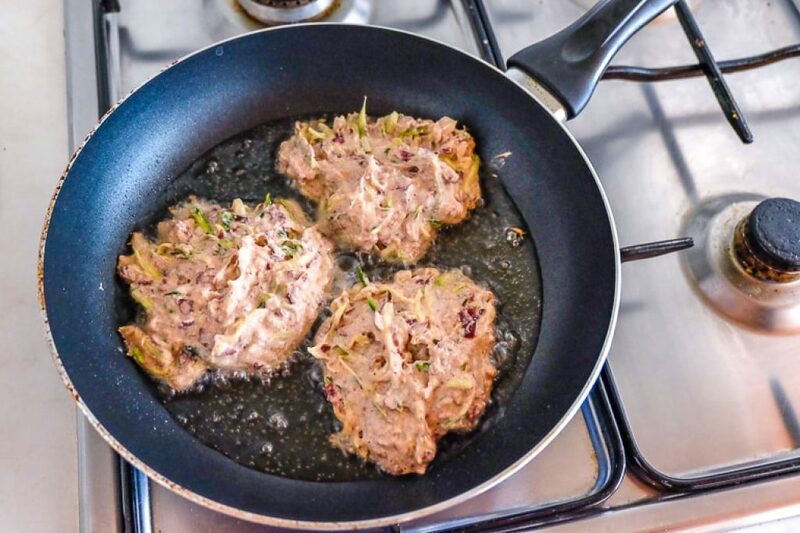 Get in touch and let us know if you make these fritters!